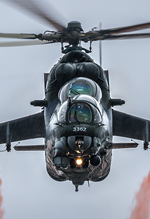 With the RAF's centenary celebrations at RIAT falling short of expectations, August saw the spotlight fall to the Polish Air Force who also trace their origins to the end of WWI and to 11th November 1918 when Poland regained their independence. With Radom airshow usually held biennially on odd years, this special year was an exception to the tradition. Billed by many as the biggest ever airshow in Poland, anticipation for the show was sky-high - but just like RIAT, this turned out to be far from the extravagant airshow everyone was hoping to witness. 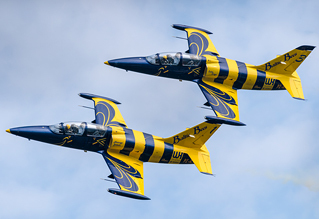 Jakub Zurek reports from central Poland for UK Airshow Review. Photography by the author. With many left feeling disappointed about the RAF's centenary celebrations at RIAT, attention shortly afterwards turned to the Polish Air Force and their one-hundredth birthday bash to be held at Radom airshow. 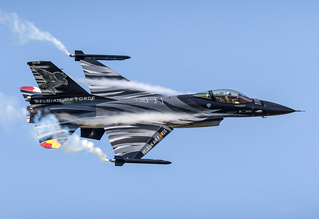 Usually attracting an exciting array of international displays alongside the Polish Air Force's own venerable MiG-29 Fulcrums, F-16 Falcons and Su-22 Fitters, this year's Radom airshow resonated with excitement in a fashion similar to RIAT even before the official date of the show was confirmed. 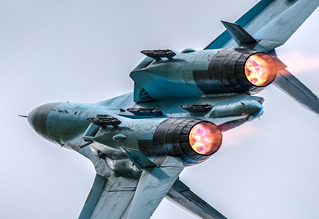 Planned participation of the Romanian Air Force MiG-21, Slovakian MiG-29, Ukraine's Su-27 and Su-25 as well as Czech Mi-24/35 and Mi-171 in the flying display further bolstered the line-up for fans of Soviet hardware. This exciting line-up of Soviet aircraft however, very quickly crumbled as August neared. The tragic accident in Romania prevented the flying pencil from once again appearing in the skies above Radom; the rumoured Slovakian MiG-29 was unable to participate for reasons unknown and after some confusion from an interview with the Polish Air Force brigadier general, it also quickly became clear that the Su-25 will only be making an appearance in the static display. The long-term grounding of the Polish Fitters and Fulcrums was an even bigger blow, and so, before the show even began, the whole charm of Radom for enthusiasts travelling from all over the world was lost. The USAF's commitment to Radom this year was also a major talking point before the show and was guaranteed in interviews with Polish Air Force officials in local newspapers. F-22 Raptors deploying to Spangdahlem in mid-August sealed the idea of a special flypast, but this failed to come to fruition, leaving Radom with a single C-130 Hercules on static display. Compared to 2017, which saw a B-1 and B-52 flypast, this really did not compare well from Uncle Sam. 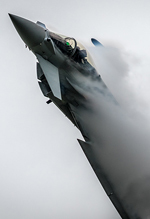 Poland's other close allies supported the show as best as they could and appropriately the RAF was able to assign the Typhoon display for Radom. The display was highly praised by locals and decidedly appropriate in this special year for the Polish Air Force, and a welcome gesture for the contribution made to the RAF by Polish pilots during the Second World War. One can only imagine the joy a single Hawker Hurricane would bring to an airshow in Poland – a stark reminder not to take the UK warbird population for granted. On a positive note, there was one very notable contribution to Radom this year, from the Pakistan Air Force. With Polish airmen, namely Władysław Turowicz, helping to form and develop the Pakistan Air Force in 1947, the relationship between the two countries helped to bring a truly exotic item to the show. 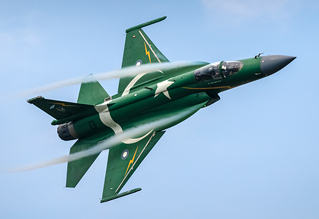 Although operating from nearby Dęblin airport alongside several other display items due to space constraints at Radom, the lively bright green JF-17 Thunder proved to be a favourite amongst enthusiasts. 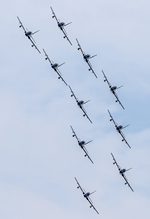 For those preferring formations and smoke, there was also plenty of that on offer throughout the weekend, with display teams from all over Europe joining Poland to celebrate their centenary. In terms of organisation though, entering the show was a major shock to the system for those used to British airshows, no matter whether big or small. Depending on which entrance one was unlucky enough to use, food was not allowed to be brought in and there were reports of a big pile of packed lunches and snacks to the side of the entrance gate - even though the airshow website featured a short guide suggesting visitors take some food or snacks for their day out! Drinks were limited to 500ml, for no apparent reason other than for traders inside the show to make more money selling beverages. These rules were also not very well enforced, as one of the author's party was able to bring in a 1.5L bottle of water inside the show (inside a bag which was patted down and then X-rayed) whilst a visitor to the side was forced to throw away their expensive thermal flask. There were also other reports of people with chairs being refused entry on Saturday morning, which was a case of a poor briefing of the security staff and luckily got sorted out in the end. One last point that also needs mentioning, is that it was impossible to leave the show and re-enter once you left, which again is a privilege we have come to expect at shows in the UK. Apart from the troubles with entering the show, another strange decision was the scheduled flying start time of 9:05 - only five minutes after gates opened… This inevitably meant very large queues to access the showground in the morning and hence visitors missing a fairly big chunk of the flying display. This was brought up several times across aviation forums and with the airshow's social media ahead of the show with no response, and many reasonable comments being deleted by the social media team. Censorship at its finest, and what an appalling way to treat paying customers who were simply (and rightly) worried about missing the start of the flying. A stark contrast can be had at RIAT, where gates open two and a half hours ahead of the flying display – not only affording visitors time to settle down before the flying, but even look around the showground. To improve future editions of Radom, someone from their team really needs to visit a show abroad and take some lessons on board to move the show forward from the dark ages of censorship and chaotic entry rules. Nonetheless, and despite the poor weather forecast for the weekend, thousands upon thousands of visitors flocked to Radom. Luckily, Saturday saw only a few short gaps in the flying and almost all the planned participants were able to take to the air and perform their flat displays in some occasional light rainfall. Unfortunately, Sunday, in line with the weather forecast, saw a heavy downpour and low cloud base halt proceedings around midday which didn't resume until 3pm with only a couple of display teams before the show closed its doors for this year. It would be unfair to judge this year's show as poor, because it wasn't. There was plenty of fast jet action with a variety of solo displays, formations, and everything in between to keep viewers occupied and lenses pointing skyward. But there was certainly something missing. The only special displays for the one-hundredth anniversary of Polish military aviation came from two Harvards which flew a very pleasing routine with the Orlik Aerobatic Team, four brand-new Bielik trainers completing a flypast, and a Boeing 737 MAX from Poland's flagship airline carrier, LOT, performing one of the lowest passes of the day. Looking back at the show now, there really wasn't many red and white checkerboards in the sky and it was a struggle to notice anything special about Radom this year. Far from it in fact, if one was to compare this year's show to previous years, there was noticeably less there from the home nation. So where did it all go wrong? Apart from the grounding of Fitters and Fulcrums which ripped the soul out of Radom, many types from Poland's arsenal were absent or only demonstrated in the static display. The planned “earthquake” flypast which was mentioned before the show was also quickly forgotten and did not take place. What is telling the most in all of these shortcomings though, is how the Polish Air Force's celebrations were opened. In previous years, a mass flypast of all Polish Air Force assets opened the show – a variety of transport types, helicopters and jets. This year, the show was opened by an Antonov An-2 in formation with AT-3s. Perhaps with budget constraints, ever increasing safety regulations, and the effort required to plan special flypasts or displays, the big one-hundredth anniversary airshows we are all hoping to see are simply not feasible and it is all a case of enthusiasts building the show up to something it will never be able to achieve. But seemingly, with Radom featuring special flypasts from the Polish Air Force in previous years, the willpower and effort in this special year should be higher than ever and feature what previous years have, and more. This should be an opportunity to have a once in a lifetime, large-scale celebration never to be repeated. 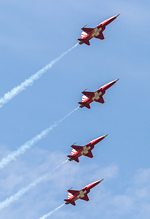 What RIAT and now Radom have demonstrated though, is that the bar that was set by the Swiss in 2014 is firmly in its place and looks to stay there for a while yet.